This one's been on my radar for a while. 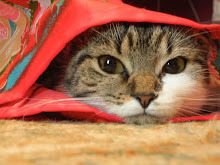 It makes many a best mysteries of all time list and is a particular favorite of P. D. James. It also happens to be dedicated to Philip Larkin, which puts it in excellent company with Lucky Jim, the only other book I know dedicated to my favorite poet. 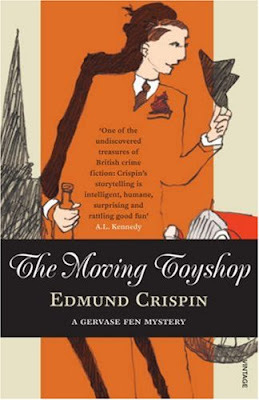 Edmund Crispin is the pseudonym of Bruce Montgomery, an Oxford friend of Larkin's. The book is very much a comedy mystery in which a pre-war poet and professor uncover a just barely-believable crime. It's very dry, and a little too ridiculous for my tastes but I enjoyed it, especially some of the literary banter. Interesting note: the penultimate chapter involves a chase in which the murderer is cornered on an out-of-control Merry Go Round. Hitchcock clearly ripped this off for his ending of Strangers on a Train, even the part with the conductor sliding underneath to get to the shut-off mechanism. Did Crispin get any credit for this, I wonder. I think one of the chapters is a parody of Brideshead Revisited. Both the poet Cadogan and Lucky Jim produce an academic work making a ridiculous link between different phenomena. I dont think the author did get any credit for the roundabout scene. I,too, found it silly. Even before the roundabout scene I thought it was like an early Hitchcock black and white film, with funny (sometimes laboured) parts surrounding a genuinely gruesome murder.